Bit by bit, the ravages of age are eroding Marina's grip on the everyday. An elderly Russian woman now living in America, she cannot hold on to fresh memories - the details of her grown children's lives, the approaching wedding of her grandchild - yet her distant past is miraculously preserved in her mind's eye. Lovely story, very sad aspects to it but you feel so much for the characters involved. The mix of the past and the present so beautifully interwoven. Have you listened to any of Yelena Shmulenson’s other performances? How does this one compare? No but would look out for others. I didn't due to time constraints but would be possible I'm sure. This is a poignant story about a woman who has lived through an awful time in our history and when in older age goes through Alzheimer. You experience this story through her eyes as she lives in the present, confused and lost and also in the past where it is clear and strong. The comparison is very stark and yet beautiful. There is a huge inclusion of artwork into the storyline which was very interesting to research further on. This book is probably best read from a printed book rather than audio. Why? Because it's written in a kind of "stream of consciousness" manner that uses the elderly character's dementia as the vehicle that tells the story. Confused? So was I. I recently visited the Hermitage in St. Petersburg (Leningrad) so I thought this would be a good book about how the museum's art work survived the cruel siege. However, it really wasn't that kind of book. The setting is present day America, but the protagonist's mind keeps slipping back to the siege of 1941. Because of the seamless and without warning changes from present day to 1941, the book was confusing. Because of that, I would recommend this book in the form of a printed book. The author had some great descriptions of paintings and the paintings' emotional connection to the protagonist. The ending was abrupt and did not resolve anything for the character's family members. It was as if the author got tired of writing and just quit. At any rate, the narrator did a superb job, but the story was just okay. I think the author's idea to use an elderly person's dementia as a tool to introduce flashbacks was very clever, but it was empty at the end because the other family members were left in the dark regarding the character's past life. So I give this book 3 stars, it was okay, but could have been a lot better. This is a GEM of a book! It talks non-judgmentally of human frailties yet expands on the unfathomable strength of the need to survive in most people. The injustices of war and the meaningless posturing of waring nations (or the people in charge) which only goes towards disruption, destruction and death. We should ask - and for what purpose? It tracks two people's lives during and after the invasion into Russia by Germany. Beautifully written with well informed comments about Art, sweet tender responses to the aging process and how the younger members react.A wonderful book which I did not want to end. The narrator was superb with just enough Russian inflection without it being overdone. I highly recommend this book!! 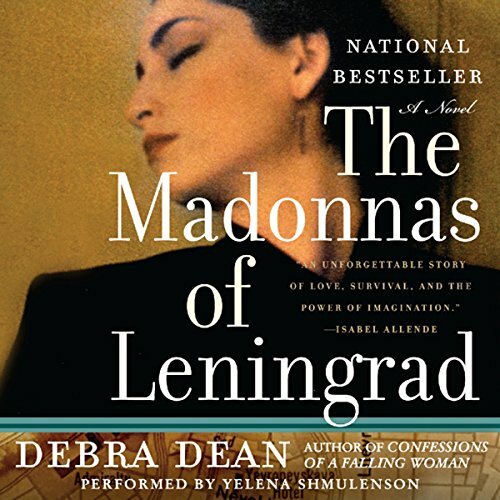 Where does The Madonnas of Leningrad rank among all the audiobooks you’ve listened to so far? I loved the historical information about the Hermitage. What does Yelena Shmulenson bring to the story that you wouldn’t experience if you just read the book? What disappointed you about The Madonnas of Leningrad? Written like pulp fiction. Very disappointing. Has The Madonnas of Leningrad turned you off from other books in this genre? I probably would not listen to this author again. Too amateur. Hard to bad material work. What character would you cut from The Madonnas of Leningrad? i want the 4 hours of my life back that I wasted on this mess. I absolutely loved this book. Well written, moved along rapidly, and gave a glimpse of how a people were able to endure great hardships imposed by man, while preserving great beauty, artistic treasures, created by man. What did you love best about The Madonnas of Leningrad? This book is well written, flowing, intriguing. The blending of recollection into the narrative is stunning. It captures so well the way recollection feels -- its unevenness, its gaps, its uncertainties, and yet, its extraordinary power over the present. Want to hear more from this author! Very much enjoyed the book, the author brought out so many visuals which the story is more about than the characters themselves. I wish the ending allowed Marina to pass on her secrets to her daughter, but life is not always like that. A Wonderful book. Story was good but slightly long. It was a goodread for a women's book group.